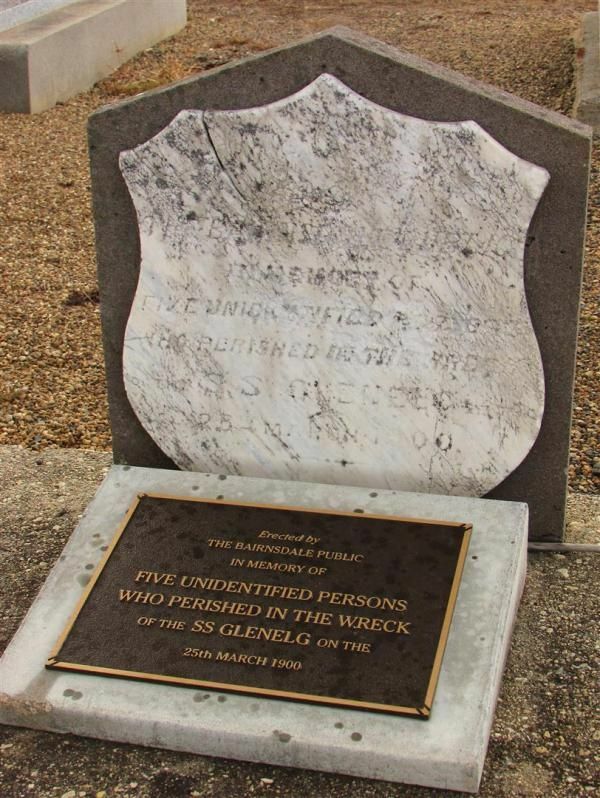 A headstone of a worn marble shield on the grave commemorates five unidentified persons drowned in the wreck of the steamer `Glenelg`. 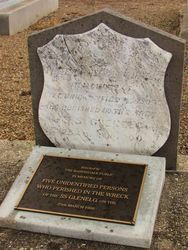 The headstone was erected by the people of Bairnsdale. A plaque has been placed on the grave detailing the inscription. 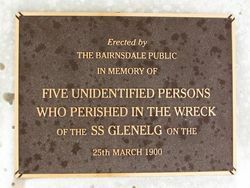 The SS Glenelg sunk on 25th March 1900 with the loss of approximately 38 lives. She lay hidden beneath the waters off the 90 Mile Beach in South West Gippsland Victoria for 109 years. The wreck was eventually discovered by Southern Ocean Exploration (SOE) on June 28th 2009. The wreck of the S.S. Glenelg, which foundered on the Ninety Mile Beach, on a voyage from Bairnsdale to Melbourne on the 25th. February. 1900, when 31 lives were lost, was recalled at the meeting of the Bairnsdale Shire Council on Wednesday last, when Cr. 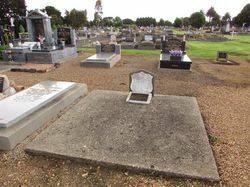 D. M. Cameron drew attention to the state of disrepair of a grave at the Bairnsdale cemetery where five unidentified bodies from the wreck were buried. The grave was erected by the citizens of the town. The council decided to have the grave put in order. Gippsland Times (Vic), 11 May 1936.